#103. Based off the card game!... Wait, what? Don't be confused by the title, this is not a card game anime, it is actually a loose mythology for the card game. I myself have zero knowledge of said card game, so I won't be making any comparisons or reference any of it's material. It is a fantasy adventure story, involving war between demons and angels, with humanity caught in-between. The main plot point focusing on trying to prevent the resurrection of an all mighty dragon known as Bahamut, able to destroy anything and everything indiscriminately. While the story and animation is pretty solid, I like this series mostly for it's characters. Some are charming rogues with hearts of gold, others are traditional knights with a strong sense of chivalry, and then there is Rita, aka best 200 year old zombie girl. 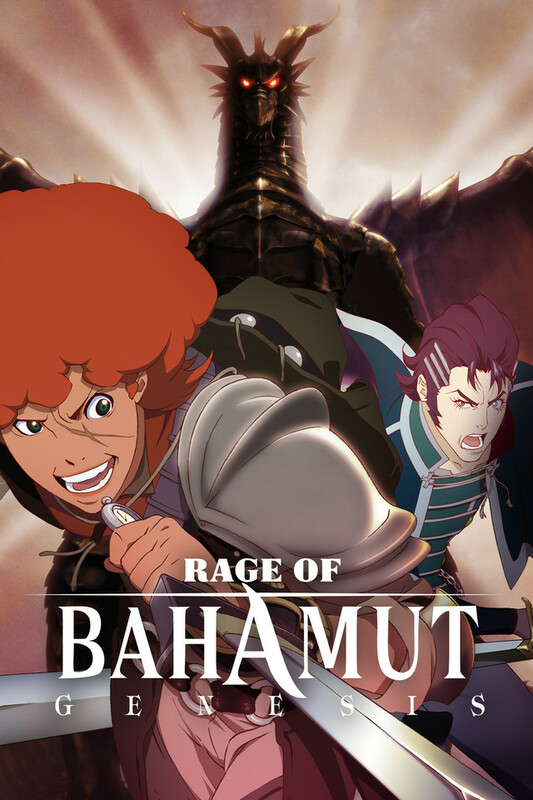 Rage of Bahamut: Genesis surely can fit your tastes if those involve medieval fantasy with an epic scope. The sequel spin-off, Rage of Bahamut: Virgin Soul, is available over at Amazon Prime Video. I wasn't expecting much, especially since the beginning is pretty bad, but it gets a lot better very quickly. The 3D animation is all over the place and the sound is some of the worst I've ever heard, but the plot is decent and the characters actually develop. This is an amazing anime. The drama, the action, the jokes! The pacing is great (though I could have used much more character development (aka more episodes! )), and I truly adored the characters. Even Favaro, that wily sneaky man! Ultimately an amazing anime and definitely recommend to watch! This is the first review I've written, but I had to say how much I loved Rage of Bahamut: Genesis. I was skeptical at first (never trust a show with a colon in its name), but RoB:G has great characters, great animation, and great potential. This felt like a classic fantasy anime, and it was put together so well. Really loved the development of the characters and loved the one I hated to begin with. I can't wait to see More!! There is more to come, right?? It would be a waste to have such a great world and charterers and then end with just this, there is so many ways you can develop this. The interaction between characters, their relationships, and background are extremely well done. Mix it with great animation and art direction, the end result being this very dynamic, action-packed, serious yet extremely tongue in cheek anime. It reminds me of Cowboy Bebop in terms of animation quality and story in some weird way. Watch it for the story. Watch it for the fights. Watch it for the 'fro. Don't care, just watch! It is fun. The story is interesting and the characters are great! I was invested until the very end. The animation is also beautiful, I didn't even mind the CGI! Highly recommend! I regret not picking it up sooner. Some might find the main characters a bit annoying at the beginning but they grow on you.....the orange afro on the other hand.... >_>"
Like the title says, it's fantastic from start to finish. From the gorgeous animation, to a fast paced and enjoyable story, this series is one I would recommend to anyone. If I had to say anything negative about the show is that I wished it was a bit longer. The show is amazing, watch it. Great characters, epic adventure, a nice amount of humor and absolutely no filler! The plot is pretty standard: ragtag group sets out on a mission to save the world by a mysterious girl, but it is done well. Very surprising series and very entertaining.